Dimples develop a uniform layer of residual compressive stress. When individual particles of shot in a high-velocity stream contact a metal surface, they produce slight, rounded depressions in the surface, stretching it radially and causing plastic flow of surface metal at the instant of contact. In the stress distribution that results, the surface metal has induced or residual compressive stress parallel to the surface, while metal beneath has reaction-induced tensile stress. Peening action improves the distribution of stresses in surfaces that have been disturbed by grinding, machining, or heat treating. classification arrangements, and a work handling conveyor. The air blast method introduces the shot, either by gravity or by direct pressure, into a stream of compressed air directed through a nozzle onto the work to be peened. Air blast method can develop higher intensities with small shot sizes, permits the peening of deep holes and cavities by using a long nozzle, consumes less shot in peening small areas on intricate parts, and has lower initial cost. Conventional shot peening is done by two methods. Method one involves accelerating shot material with compressed air. Shot is introduced into a high velocity air stream that accelerates the shot to speeds of up to 250 ft/s. The second method involves accelerating the shot with a wheel. Laser-shot peening utilizes shock waves to induce residual compressive stress. The primary benefit of the process is a very deep compressive layer with minimal cold working. Layer depths up to 0.40” on carburized steel and 0.100” on aluminum alloys have been achieved. Mechanical peening methods can only produce 35% of these depths. Dual peening further enhances the fatigue performance from a single shot peen operation by re-peening the same surface a second time with smaller shot and lower intensity. Peening the surface a second time drives the peaks into the valleys, further increasing the compressive stress at the surface. Where dual peening increases the compressive stress on the outer surface of the compressive layer, strain peening develops a greater amount of compressive stress throughout the entire compressive layer. This additional stress is generated by preloading the part within its elastic limit prior to shot peening. When the peening media impacts the surface, the surface layer is yielded further in tension because of the preloading. The additional yielding results in additional compressive stress when the metal’s surface attempts to restore itself. 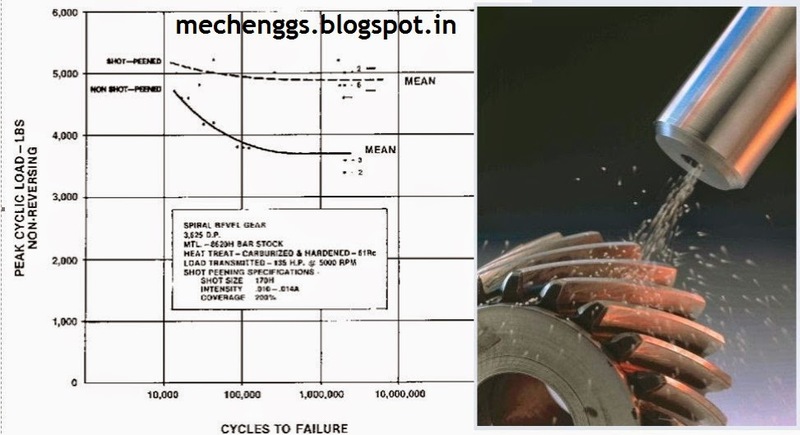 Cavitation Damage, Fretting and Fretting Fatigue, Galling, Pitting, Crack Arrest, Stress Corrosion Cracking , Figure shows the concept of compressive crack arrest. Prevents cracking due to wear. Possible to increase the fatigue strength of damaged parts extending the wear. Increases lubricity by creating small pores in which lubricants can accumulate. Leaves a uniformly textured, finished surface ready for immediate use or paint and coatings. Can be used to curve metal or straighten shafts without creating tensile stress in a Peen forming process. In this method the thin foil can be joined to the surface of the substrate bringing about large plastic deformation and the pressure generated by the hit of many shots are utilized for the joining. The lining process using shot peening is suitable for the joining of thin and dissimilar foils required for the improvement of surface properties. By means of peening with many shots, the foil is successfully joined over the surface of the substrate. Difference between shot peening and shot blasting ? ?